Historians assert that about 400,000 Africans were brought to the North American mainland as enslaved people during the transatlantic slave trade era, from about 1619 through to about 1808. At the end of the American Civil War, the direct descendants of these enslaved Africans numbered about 4,000,000 African Americans, who were emancipated in 1863-1865. Today, African Americans, many who are descendants of these former enslaved, number about 40 million, and make up approximately 12 to 13 percent of the American populace. To date, there is no major memorial in the United States of America dedicated in honor of the men, women, boys, and girls who were bought and brought to the colonies that became the United States of America. There is certainly nothing on the scale of the Vietnam War memorial, the World War memorials, or the Holocaust memorials. That is a travesty that needs to be rectified. A memorial acknowledges the wrongs against, and sufferings of, those who were enslaved; and it allows all of us living with the legacies of slavery—descendants of slave-holders, slave-traders, and enslaved, alike—to come to terms with it, and importantly, to heal from it and move forward in unity. Any travesty unacknowledged allows guilt, anxiety, distrust, fear, bitterness, and anger to foster in the community where the event happened. On the contrary, commemorating the event becomes a watershed place and moment that allows a collective moving forward. Above is a conceptual memorial designed in honor of the millions of men, women, and children who were enslaved in the colonies and states that became the United States of America. It evokes and commemorates all the generations of enslaved—from the first bound African whose foot touched American soil, to the youngest person set free by the emancipation proclamation. To commemorate the former enslaved, it is proposed that a fitting national memorial be designated in their honor. A design concept is shared above. It was designed by Atlanta-based Landscape Architect Kwesi DeGraft-Hanson, Ph.D. of Eden Gardens International. Design inspiration came from enslaved persons’ names in various slave registers extant in slaveholder family papers in archives and historical societies throughout the United States; from spatial patterns and rhythms in the cultural and ecological landscapes of West Africa, and in the American South where enslaved persons toiled in indigo, tobacco, rice and cotton plantations; and from the histories of these landscapes of slavery. The memorial would feature digitized enslaved person names inscribed in smoke-gray glass walls, with the names streaming past visitors in red liquid crystal display (LCD) inside the walls. Memorial walls would be reflective and translucent, allowing visitors to see themselves, and through the walls to the symbolic “other side.” The walls would appear to have been broken in two (with jagged ends symbolizing how the slave trade and slavery disrupted African communities, and repeatedly dislocated African American families). The fourteen-foot high memorial wall’s angled ends (wedges) will fit into each other when placed end to end (full circle), symbolizing the eventual restoration of individuals, families, communities and cultures damaged by slavery. The curving walls symbolize waves, wind-loaded sails, dispersal, indomitable spirits and ultimately, freedom. Each wall will have seven memorial palm trees planted in their vicinity. The commemorative walls would have water springing from their top center, flowing in opposite directions down the jagged ends, into reflective pools of water. Shallow, darkened, circular (or quadrilateral) water pools at each end of the memorial wall allow contemplation and reflection, suggesting refreshing, regeneration, and healing. The water would also seep (weep) down through the wall, like soft, sheeting rain; and also flow on the outside of the walls, down onto porous beds of smooth, black, lava rocks. 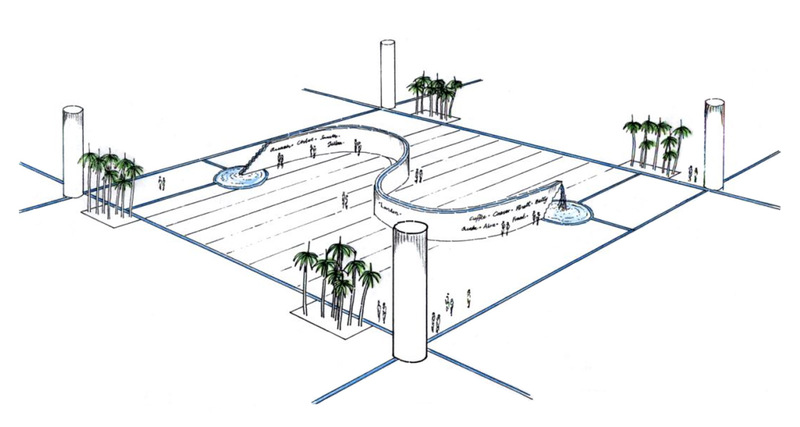 The water circulating in these memorial fountain walls should initially be a collection of waters from all the rivers on the Atlantic and the Gulf Coasts of the USA, and water from the Atlantic Ocean. These waters were instrumental in facilitating the slave trade and slavery, and, as well, sustained enslaved persons in their daily living, or in their escapes from enslavement. Ideally, the memorial would consist of seven curved walls (which represent African personal day names—based on days of the week—many which are still represented on various extant enslaved persons’ lists, and the Biblical number of completion). A grid of water rills that spatially demarcate the “tasks” of “full-hand” enslaved persons—a half-acre—would provide the setting for each wall. Contact Us today for more information. We are available to provide lectures at your institution or organization to describe this unique project, and raise awareness for this endeavor.